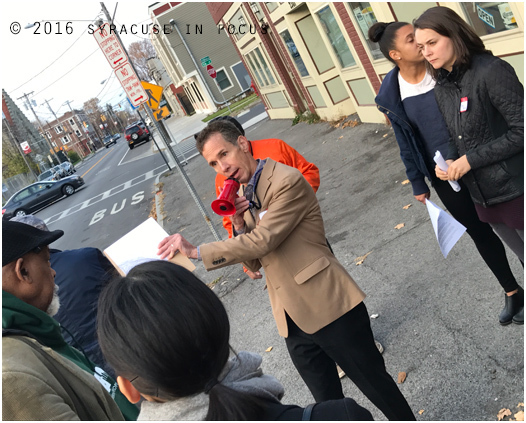 During a tour of the Northside recently one of the longtime shop owners refer to the North Salina Corridor as “Little Italy,” while a tour guide cited changing demographics for calling the neighborhood “The Gateway to Many Nations.” The tour was facilitated by Northside Up and SUNY-ESF. 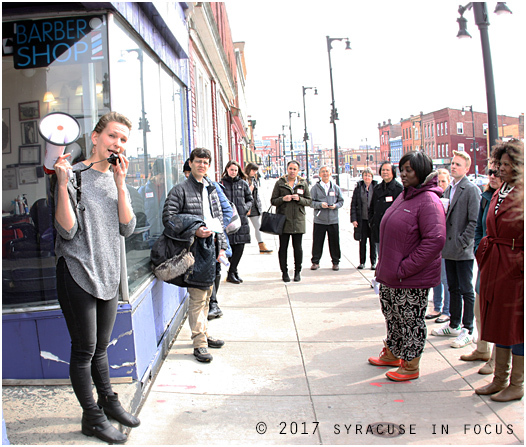 Here Northside Up’s co-director Stasya Erickson talks about the neighborhood on the steps of 754 Barbershop. The Comedy & Chill series at Dolce Vita has provided some much needed stability as the Midtown neighborhood undergoes another massive transition. Liberty Deli and the Crogan Building were recently demolished to make way for more student housing. 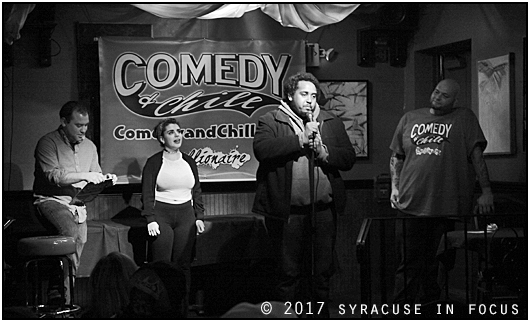 Pictured here are comics James Fedkiw, Kelsey Claire Hagen, Abdulkadir Hadi, and organizer John Leonard Bellavia. Hopefully, the laughs and series will continue. 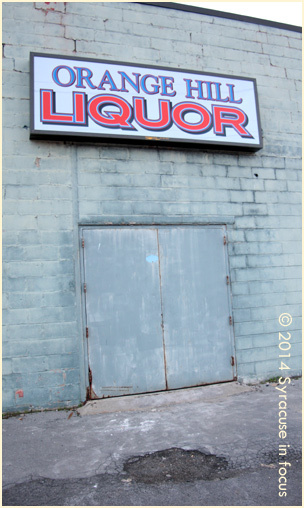 Jim Bright led a tour of Brighton/Salina Corridor earlier this week. The tour, which was part of SUNY ESF’s Center for Community Design Research Visioning Voices Community Speaker Series, highlighted neighborhood properties such as People’s AME Zion Church, the South Side Innovation Center Dunk & Bright, the South Side Communications Center, the Mary Nelson Youth Center as well as a handful of projects in progress (Shawn Casey Building, Aspen Heights and Salina Crossing). Dunk & Bright has been a family business for nearly 100 years and the location on South Salina Street is 90,000 square feet. 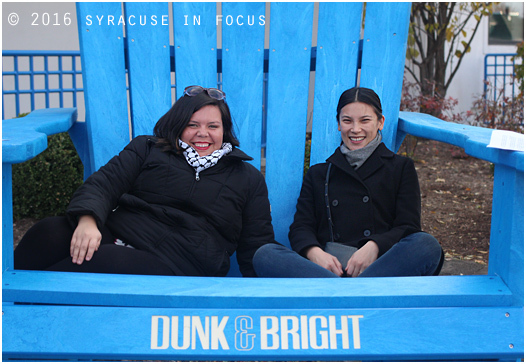 Isella Ramirez and Casey Wang, program managers from the Hester Street Collaborative in NYC, visited Syracuse yesterday for the Visioning Voices Community Speaker Series. Hester Street uses design as a tool for neighborhood planning and change. Before the presentations the two planners joined a small group of residents on a brief tour of the Brighton/Salina Corridor. 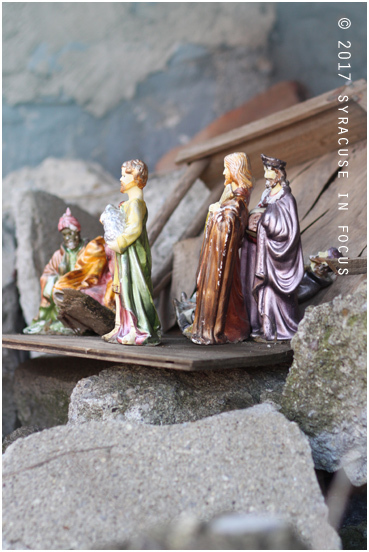 They are pictured here resting outside Dunk & Bright Furniture. 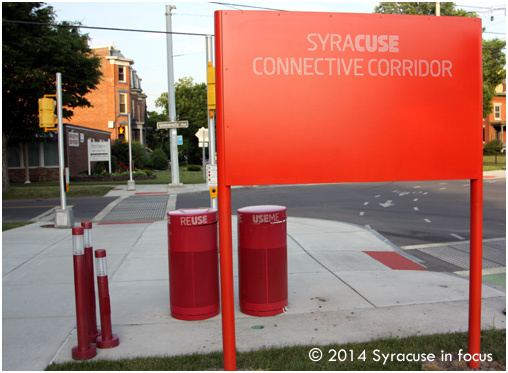 Last week USA Today highlighted several towns to experience public art and Syracuse was not on the list. 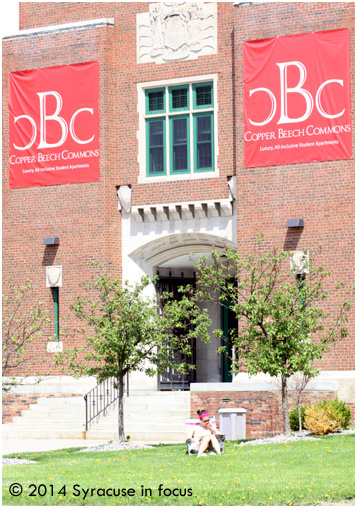 Hopefully that will change because at last week’s outreach meeting the Connective Corridor staff reported that nearly 300 artists submitted proposals to enhance the cultural and business district. Also, more facade and lighting projects are coming. And while we look forward to the aesthetic possibilities, we know it’s the day-to-day work that makes a difference. We caught up with construction manager Gregory Miller at the outreach meeting to talk about his role. Today is National Running Day. Regardless of the season, Syracuse is certainly a runner’s town. 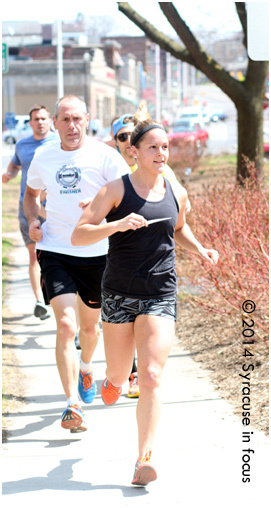 Fitness fanatics from Urban Life Crossfit are pictured above during a run around Forman Park earlier this Spring.